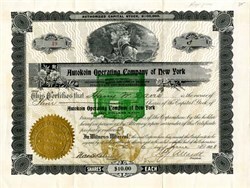 Beautiful stock certificate from the Autokoin Operating Company of New York issued in 1908. This historic has an ornate border around it with a vignette of a woman and an overprint of a nickel-in-the-slot electric piano. This item has the signatures of the Company's President, H. J. Allardt and Treasurer, Nathan B. Blum. 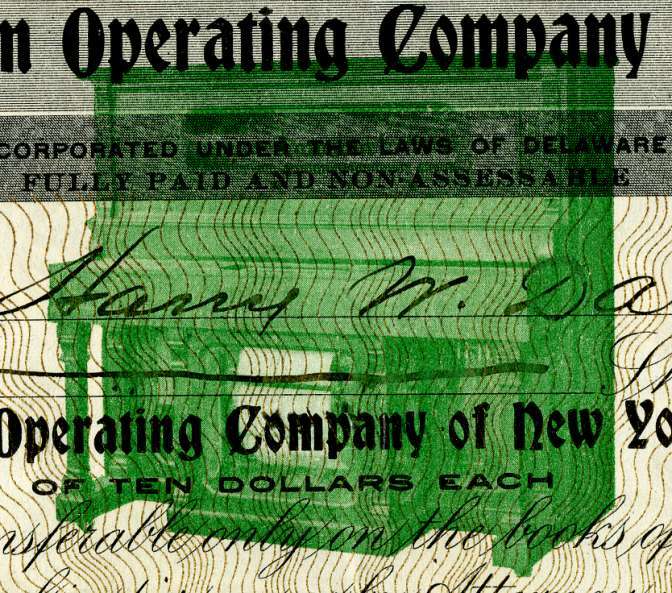 The certificate was issued to Harry W. Davis and was signed by him on the verso. 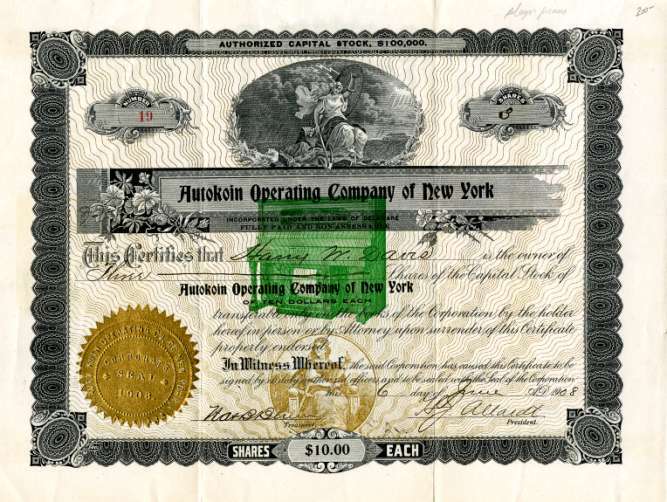 The Autokoin Operating Co., New York, was incorporated under the laws of Delaware to operate nickel-in-the-slot electric pianos. THE SHARES OF THE AUTOKOIN PIANO OPERATING COMPANY ARE RECOMMENDED TO INVESTORS AS AFFORDING ONE OF THE BEST MEDIUMS FOR THE PLACEMENT OF CAPITAL THAT HAS PRESENTED ITSELF IN A LONG TIME AND THE STOCK IS CERTAIN TO GROW STEADILY IN EARNING POWER AND VALUE. It has always been a policy of this journal to keep our readers posted from time to time on such opportunities for safe and profitable investment as appear to possess advantages beyond the ordinary. In this connection, we cannot recommend too highly, as the result of careful investigation into the operations of the company, the shares of the Autokoin Piano Operating Company, the authorized capital of which is $1,000,000 and which is noteworthy as a company without a liability except to its stockholders. From what we have learned of the company and its workings, we feel justified in saying that money could not be placed more safely or with greater assurance of large nnd quick returns than in the shares of this undertaking, the New York office of which is located at No. 225 Fifth avenue, under the charge of the Eastern agents, Blum & Rosenthal, a concern Incorporated under State laws, the two prinicpals being Nathan B. Blum and Jacob Rosenthal, both of whom are well known in business circles as gentlemen of the highest standing and responsibility, whose identification with any enterprise is sufficient to guarantee its sound and commendable character, Mr. Blum is one of the directors in the Autokoin Piano Operating Company, the purpose of which is the placing of automatically operated pianos In popular resorts in all the leading towns and cities throughout the Union, the deposit of a tlckel resulting in the rendering of a Rulection in a manner that leaves nothing to be desired even by the most critical. The instruments and methods by which this end Is attained are superior la every way to similar attempts that have been made in this field and which, despite their inferiority, have been immensely profitable. There is no question in our mind that the shares of the Autokoin Piano Operating Company will yield a certain return of not less than 30 per cent, and is, indeed, likely to exceed that figure. The company's stock at this time In selling at $4 a share, with a par value of $10, at which attractive price it constitutes a bargain that should be eagerly snapped by the far-sighted investor. The time is not far distant that the stock will he difficult to obtain at any price, so firmly is it likely to be held, in view of its money-making qualities, by those fortunate enough to possess a block. Messrs. Blum & Rosenthal will be glad to supply particulars of the company, Its operations and its possibilities, to all interested and to both large and small investors the enterprise presents a chance that seldom comes and which should be promptly taken advantage of. The management of the Autokoin Piano Operating Company is capable and progressive, and the undertaking has proved successful from its very inception. The concern is destined to be one of the great moneymaking ventures of this century. The piano has been practically tested and demonstrated not alone to your correspondent, but to hundreds of people daily who pass through the "Gilsey House," at Twenty-ninth street and Broadway, where it is on exhibition.